Lady Gaga has a new social network called littlemonsters.com you can create an account or you can sign in straight from your Facebook. I wonder what made Lady Gaga want to have a social networking website is that what all the celebs are doing now. Is that the new trend? If so I wonder who will have the next one, my cards are on Justin Bieber. Take a look at the social network. 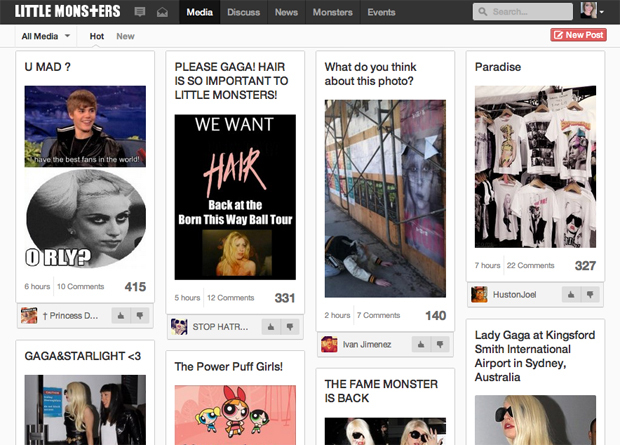 http://littlemonsters.com/ login with your facebook and give it a try it remind me a little bit of pinterest.com with the layout. But congulations to Gaga for making this happen, I hope it does well. Facebook has some competition from Lady Gaga.